Generally speaking, games in the beginning days were a lot harder than they are now. While there are some exceptions to the rule like Dark Souls, the majority of modern computer games are anything but challenging when compared to 8-bit or 16-bit games. If you have ever played games like Ninja Gaiden, Double Dragon 3 or The Adventures of Bayou Billy for the NES, you probably can agree to that. And here comes Ninja Senki, a game heavily inspired by the 8-bit era. It is a portable game for Windows, and as the name suggests, a ninja-style jump and run game that puts you in the role of Hayate, a guy who has just lost Kinuhime who was killed by ninja demon. Now everything is set up for revenge. The game is offered for Windows and fully portable. Just download it from the developer website and extract it to a directory on your computer. It supports gamepads and keyboard controls. As far as keyboard controls go, you use the left and right keys or A and D keys to walk, J to throw shurikens and K to jump / double-jump. Enter pauses the game and + or - adjust the screen size. If you want to enjoy the game fullscreen you can press F4 to do so. If you have never played 8-bit games before and are used to save points and automatic healing while you duck behind cover, you probably will have troubles getting far in this game. You have five health points which recover every time you get 1000 points in the game. Once they reach zero your live count drops by one, and since you only have two extra lives, you have to make sure that does not happen. The developer notes on the game homepage that skill is required to play the game, and I can attest to that. There is lots of jumping in the game and if you do not time some of the jumps perfectly, you may end up losing a full live if the jump did not make it all the way to the next platform. And like any good old NES games, enemies have a tendency to block your jumps so that you fall off the sky like a rock. The game is definitely fun to play for a while, mostly because it is challenging. 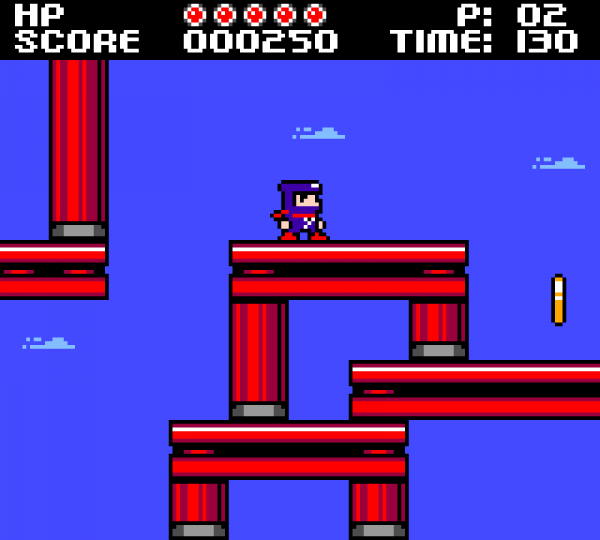 If you would like to relive some of your 8-bit memories then this is definitely a game to try. Most younger players however may dislike the game because of its graphics, music and difficulty. Still, if they would look beyond that, they may find an enjoyable game that is fun to play.